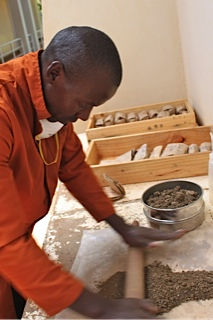 Grinding and sieving one of the 19,200 new samples collected using the Land Degradation Surveillance Framework. AfSIS is undertaking a number of new ground data collection efforts. In combination with remote sensing and legacy soil profile data, these extensive field campaigns are providing critical new baseline data for continent-wide soil property maps and targeted soil-based field management recommendations. Chief among these are the new soil surveys using the Land Degradation Surveillance Framework at each of 60 sentinel landscapes across Africa south of the Sahara, including 160 soil profiles (top and subsoil samples) in each landscape, for a total of 19,200 soil samples. Cumulative mass to 100 cm and infiltration are also measured at selected plots within each landscape. Diagnostic field trials are also being conducted at 12 of these locations, which are statistically representative of the variability in climate, topography and vegetation of the project area. Agronomic and socioeconomic surveys are also being conducted in same locations as the field trials, in Mali, Malawi, Kenya, Nigeria, and Tanzania. For both LDSF and agronomic surveys, AfSIS is pilot testing the use of mobile devices using Open Data Kit for real time, distributed access to field survey data. Field guides and data collection toolkits are also available.